The following text was found in the Gitche Gumee Museum’s archive. There is a note attached that says it was taken from The Superior Sun (1929), which in turn took it from Geographical Reports of Douglas Houghton, published by the Michigan Historical Commission in 1928, but written in 1874 by Bela Hubbard. “Among the pleasantest of all my reminiscences of travel is that of the exploration, in connection with the geological survey of Michigan, of the coasts of our upper peninsula in 1840. The party for this expedition was composed of the State geologist Dr. Douglas Houghton; his two assistants, C.C. Douglas and myself, Fred Hubbard, in charge of instrumental observations; for a part of the way, H. Thielson, a civil engineer; and Charles W Penny, a young merchant from Detroit. …”The beaches [of the southeastern shore of Lake Superior] terminate at a deep harbor called the Grand Marais. Steep cliffs are first observed rising from the water with a very uniform face, of about 200 feet in height, beyond which are visible dunes, rising still higher in the distance. On our approach the whole appeared like lofty hills enveloped in fog. This proved to be nothing less than clouds of sand which the winds were constantly sweeping toward the lake, and which formed a mist so dense as to conceal completely the real character of the coast. On ascending these steep and wasting [sand dune] cliffs, a scene opens to view, which has no parallel except in the great deserts. For an extent of many miles nothing is visible but a waste of sand; not under the form of monotonous plain, but rising into lofty cones, sweeping in graceful curves, hurled into hollows and spread into long-extended valleys. Thrusting through the sand are several tops of half-buried pines, barkless, and worn dry and craggy by the drifting sands, while below the surface their [trunk] bodies appear to be in perfect preservation. To our imagination they seemed the time-worn columns of an antique temple, whose main structure has long ago tumbled into dust, or been buried like the ruins of Egypt, beneath the drift of many centuries. At Grand Marais the surface sand is mostly packed quite hard, and may be trod as a solid floor. This, in many places, is strewed thickly with pebbles; the deep hollows presented vast beds of them. 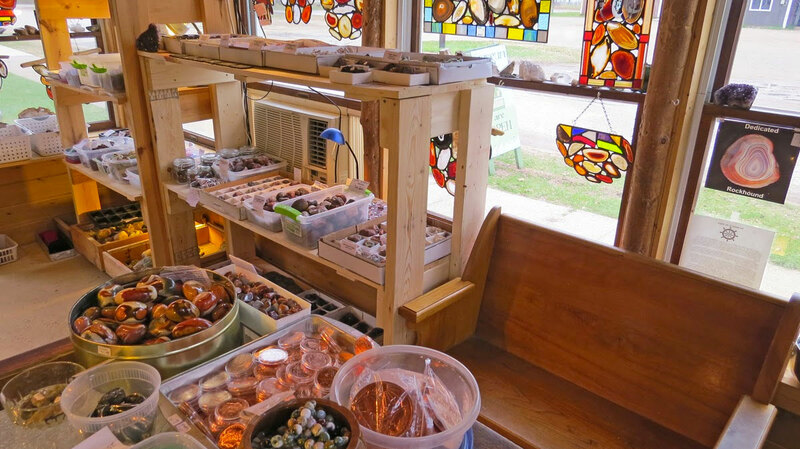 Among these are a great variety of precious stones common to the rocks of the country – agates, chalcedony, jasper, quartz of every shade of color and transparency, with hornstone, trap, and other minerals. All are worn smooth, and often beautifully polished by the sharp, drifting sands; many rich specimens were obtained. We were reminded of the valley of diamonds in the Arabian tales, which it was the fortune of Sinbad to discover, in scarcely less singular depository. In the rear of this desert, a small and beautiful lake lies embosomed. From the diamond lake, issues a small stream (Old Grand Sable), which after making its way through the sand, reaches the clay that constitutes the base of these dunes, and tumbles a perfect cascade into the greater lake. This rivulet separates the dense maple forest which lies on the east from the cliffs of driven sand, which rise abruptly to a height that far overlooks the woodland, and are the commencement of the Grand and leafless sables. The view on ascending these is most entrancing. On the one side stretches beneath, and far away, the verdant forests; while by a transition as sudden as it is opposite in character, on the other side every feature of the landscape seems as if buried beneath hills of snow. The desert surface might be likened to that of an angry ocean, only that the undulations are far more vast, and the wave crests more lofty than the billows of the sea in its wildest commotion.